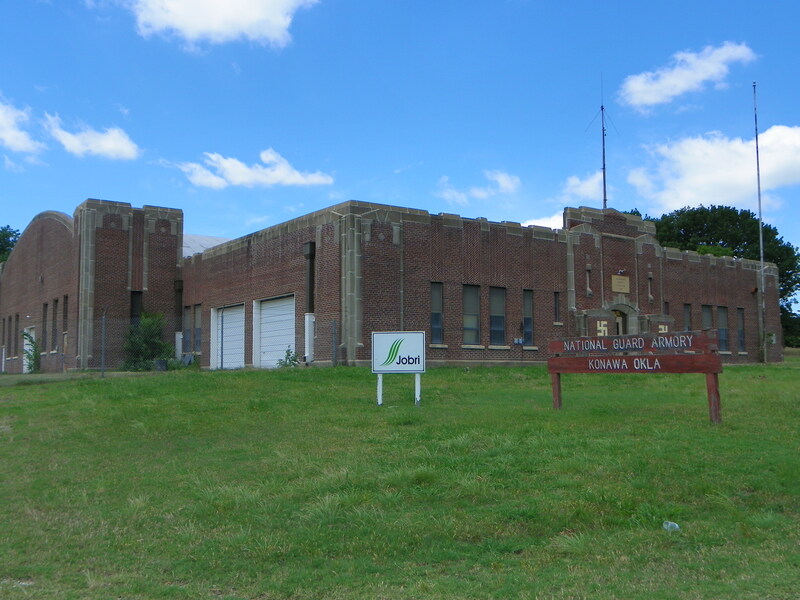 The Konawa Armory is one of the more attractive buildings in southern Oklahoma. The building is a single-story brick structure. It has a drill floor with a high arched roof and a wing on the east side with a lower flat roof. The main entry is recessed inside a concrete arch and framed by pilasters with concrete moldings. There are three garage doors. The casement windows have concrete sills, and the drill floor has arched parapets with concrete caps on the ends. Additional decoration is provided by stepped pilasters, framed by concrete mouldings on the corners and brick insets above the windows. One noteworthy piece of decoration is on the piers that sit on either side of the main entry. On the right pier is a native American thunderbird (reversed swatzika) and on the left pier is a true swatzika. 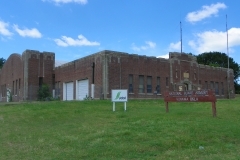 The Konawa Armory is significant because of its brick construction, unusual for WPA armories in southcentral Oklahoma, and the extent of its concrete moldings. Stylistically it suggests intricate detail, complicated design, and skilled workmen. The use of the swatzika, a Native American emblem, as a decorative element also makes it unique, especially since the swatzika is generally associated with the hated Nazi that the unit stationed at the Konawa Armory and other Oklahoma National Guard units later battled during World War II. The armory, swatzika and all, helped prepare the guard for that major encounter. Construction of it, also, put to work hosts of unemployed oil field workers, giving them some economic security and providing a job skill that they could employ during better economic conditions. VERBAL BOUNDARY DESCRIPTION: A tract of land that begins 675 feet west of the SE corner of NWl/4 of Sec. 26, T6N R5E, and runs 416 feet north, 208 feet west, 416 feet south and 208 feet east. Konawa also needed the economic stimulus a WPA armory construction project could bring. Situated in the former Seminole Nation, Konawa was founded withthe influx of non-Indian settlers following the dissolution of tribal government in 1903. It was the second largest town in Seminole County with 896 people in 1920. The opening of the Greater Seminole Oil Field in the mid-1920s saw Konawa’s population reach 2,070 by 1930. Oil extraction added prosperity to a rural economy based on cotton and peanuts produced primarily by tenant farmers. The drastic decline in oil and commodity prices in the late 1920s, widespread drought, and a national economic crisis in the 1930s brought hard times to Konawa. To make matters worse, oil field waste and brine pumped into nearby Salt Creek destroyed the fertility of the land. Those who suffered most were Seminole County’s tenant farmers and the unskilled laborers who made up most of the oil field work force. By June 1935, 3,707 head of families and single people, comprising 20 percent of the county population, were on the relief rolls. Konawa’s trustees greeted the announcement that the town was to receive an armory project with great excitement and donated a one acre plot in the southwest corner of the city park for a building site to show their support, thus meeting the WPA regulation of community sponsorship. 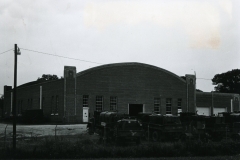 Ground was broken for the Konawa Armory on October 22, 1935, and construction began late in the fall. Teams and slips leveled the ground in early December. By February 1936 thirty men were regularly employed at the site. Limiting these men to four days’ work per week at a guaranteed wage of twenty-three dollars a month restored both their independence and their purchasing power. Konawa Lumber Company supplied 80,000 board feet of lumber and miscellaneous materials. Hundreds of thousands of three-inch wood blocks for the drill hall floor were cut, sanded, inlaid, and treated with linseed oil by the unskilled workers, while 317,000 bricks from McAlester, Oklahoma were used in the building. When truckers refused the regular WPA wage scale, Guardsmen stood ready to deliver supplies. 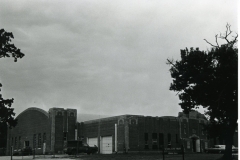 Bad weather and shortages in steel materials slowed construction, but the armory was finished in mid February 1937. Those participating in the formal dedication on February 19 included State WPA Director General W. S. Key, as well as architect Major Bryan W. Nolen. Observers noted that not only did Konawa receive in the new armory a permanent useful addition to the town, but also a number of men hired from the relief rolls as unskilled laborers finished the job as experienced brick masons and mechanics, their employability greatly enhanced. 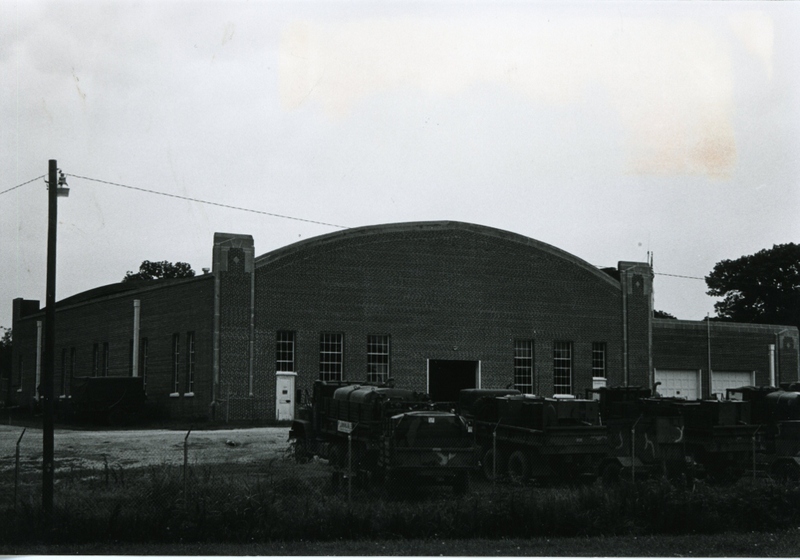 The completed Konawa Armory was estimated to have cost $30,000. Included in the 125′ by 140′ building were administrative offices, storage rooms, an arms vault, classrooms, a locker room, and garages. The drill hall, measuring 83′ by 108′, included a stage with a basement rifle range. The size of the building and striking style made it the most imposing building in the small town. 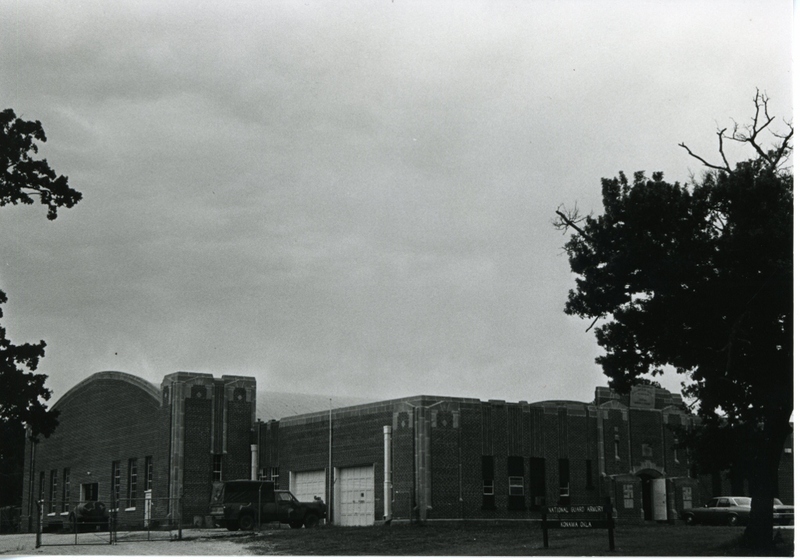 The Oklahoma National Guard unit that received the Konawa Armory as its new headquarters was Company F, 2nd Battalion, 179th Infantry, organized May 21, 1921.